Ventures in Pixels Blog - Marketing, Internet and Vietnam: Do you feel the Buzz? Vietnam's one hell of a colourful, exciting, frustrating, fun, hard, easy place to be. Ok, full of contradictions, but that's what it's like. Generally people here accept what is familiar, rather than something that challenges them, so the normal social networks need to make a real effort to get take-up. Facebook probably has the biggest opportunity, because as a platform it is fully customisable, and the bedroom/backstreet developers will go to town on creating VN widgets which are fun and familiar. Right now, we're just rolling out Buzz.vn. It's for hot news, hot links, for your bookmarks and to share with your friends. I guess the best way to describe it is Digg marries Delicious, has twins and comes to Vietnam. It's been a hell of a journey to make, a truly global collaboration between London, Vietnam, with Eastern Europe in between. It's for local Vietnamese and for Viet Kieu (overseas Vietnamese) too. Will Vietnamese get the Buzz? Who can be sure. These ventures are forever speculative. But we've got some great, interesting content already posted from Khoa and Nhi, our editors. And I hope that visitors will keep discovering the Buzz through cool, fun, challenging, shocking, useful content they find on the site. There are loads of features and functions we'll add, but for the start, we've stripped it back, to make it easier for new users to find their way. You can post, you can save links, you can have buddies and you can vote. Or you can just read. 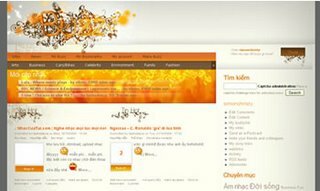 Now the challenges ahead lie in getting the word 'buzz' in the vietnamese language, getting good members, good traffic, getting good content. But we've got some fun marketing ideas that might just help that along. (Some things that have not been done in Vietnam before). I'll share them here very soon. Oh, and the slogan - It's only hot when you make it Buzz! Congratulations Simon and good luck with this new venture. Some Linux News Happy New Year !